Great, there is a monitor. Is it wireless, waterproof and mounted to the bench? Who moves it from the long line to the short line? Mudproof? Just curios about how they would work at Perry. Since you cannot scope the shot is there a monitor for each person so if you need to change point of aim/scope adjustment ? Yes, every electronic target system I have seen has a monitor at the firing point. It adds a new challenge because there is a HUGE temptation to immediately look down at the monitor. I am ready for convincing. I shoot at an E-target from the long line into a 50yd sized black hole(irons or dot). I get feedback from a monitor of my shots. We move to the short line and shoot at an E-target into a 25yd sized black hole(irons or dot). Since I assume they are not turning for the short line there is a light or horn to start and end the stage ? I have never challenged a shot but would assume that it will happen with some shooters. What do you do using the E-targets ? My fear is investing into all the fee's for shooting a national match and shooting upon a target with a glitching light, hammered E-target box and etc. Who really is in charge to make sure each and every E-target box is as accurate as it was out of the box and calibrated ? Are they going down the whole line to inspect and re calibrate all the targets after every 900 ? Paper is easy, score it, challenge it, whatever. Done deal and move on. C.perkins, as of now... There are no rules in either the NRA or CMP rule book. The CMP has and are currently asking for input on the new rules. From what I have seen, there will be no challenging of shot targets. After the shot, there is no physical evidence. As for proof of calibration, it's been " take the manufacture word for it.... "
Another problem is the fact there is no X in the middle to look at if shooting a dot. I borrowed one of Clarks pictures (thanks) but seriously, tell me again where they are going to place the monitors. James Chapman wrote: ".. I watch many scoring challenges in International rapid fire events..."
.....yeah, and it's some stiffs who can't shoot looking at some receipt tape that just recorded whatever the sensors recorded. That's not the same confirmation that we get from examining the real paper target. Do they shoot 9mm,40SW or 45 ACP ??? Do they have marksmanship and sharpshooters bouncing shoots off the frames? Do they get sighted shots??? And most importantly, there will be no targets to hang on the wall after shooting a clean SF at CP. OldMaster65 wrote: I borrowed one of Clarks pictures (thanks) but seriously, tell me again where they are going to place the monitors. I am sorry, but I just cannot get too excited about shooting in that shtuff. I have never been to a range with worse conditions than Camp Perry. It is then exacerbated by the fact of how far you have to walk to your firing point, carry nine full targets along with equipment you would normally leave in your car at a local or regional match, and lack of target maintenance. I don't mind shooting in wind and rain but when you add in the other factors that I only see at Camp Perry, it is not a good experience. Thousands of scoring challenges are settled every year using targets that have repair centers stapled to them. So much time and money would be saved by doing the same thing for Nationals. It is past due for a change of venue. We need new shooters and we need to bring back the shooters who are not going to Nationals anymore because of the conditions. The question is almost phrased like: "when did you stop beating your wife?" Do you want Cardinal Center with turning (paper) Targets or Camp Perry with electronic targets? Not exactly a democratic choice. However, after reading Dennis' posts, it becomes obvious that he intends to move the National Championships to the Cardinal Center--no matter what the thousands of competitors prefer. As someone that help build our club's electronically-timed, pneumatic target-turning system, although not on the scale of Perry, but based on our cost, surely nobody is going to state that it would cost $6.5 million to upgrade the existing timing and turning system at Camp Perry? It is inconceivable, after 100+ years of history and tradition at Camp Perry, a few people want to abandon it???? History and tradition trumps concrete floors at firing points and golf carts and a facility-wide PA system, no lake effect wind, no boats in the impact area, no mud and a "lockable" shower facility? These are part of the atmosphere and mystique of Camp Perry and makes it unique. Come on, that's really reaching! If shooters want all of these amenities, including staying in hotels then, maybe for $6.5 million we could all stay in hotel rooms or at home and compete using video broadcast over TVs in our rooms. Camp Perry is more about history, tradition and venue than amenities!!!!!! This appears to this decades-long Camp Perry competitor as merely change for the sake of change! Many people had the same "historic" argument when the moved the Grand American from Vandalia, Ohio (1923-2005) to Sparta, IL. When it comes down to it either option is lost history. We either lose the location and change to eTargets, or we stay on paper turning targets and move to a new location. When the ATA moved to Sparta the sport didn't change just the venue. That's why Cardinal gets my vote. I do not agree with your statement: "...We either lose the location and change to eTargets, or we stay on paper turning targets and move to a new location..." There are two other options: marshal enough support from NRA BOD members to force upgrading of Perry's existing system or #2, boycott Cardinal and, possibly a #3, completely turn over the National Matches to CMP. Why are two separate organizations needed to operate one national championship? NRA keeps whining that it is loosing money on the national championships then, give them an out. Surely one organization could run the event more efficiently than two. CMP is a well-organized and well-run organization. Comparing the National Pistol Championships at Camp Perry to the AMA is comparing apples to oranges. "No one likes change." Obviously you do since you advocate Cardinal. I understand you want to stay at Perry. I also like the nostalgic Camp. But nostalgic doesn't put boxes on the firing line. Tradition doesn't stop the slow decline of our numbers. Even if we stay at Perry, our sport will completely change with E-targets. We will now shoot international pistol with big caliber handguns. You want to keep history and tradition? How long have we used paper turning targets? Is that a more imported point to our sport than location? Like I said I am bias. I have thought about this long and hard before this project was even known to all but two people. For the last 10 years the sport that we both love to compete in, has dwindled... Why? Well that is a complete thread in itself. Sitting around bitching about this or that doesn't solve anything. 1st) If we completely turn over the National Championships to CMP we get eTargets. The CMP has a vested interest in increasing the use of eTargets as they are now the US distributor of the KTS systems used at Talledaga. It appears they have a proposal and money approved to install eTargets at Perry. 2nd) ATA members had as much nostalgia for Vandalia as many have about Perry - that was my point and it is valid. I'd also prefer to stay at Perry I picked Cardinal over Perry, given the choices. Either way it's change and I'd prefer to stay on turning targets. I will say not standing in mud helped too. You want a solution to the NRA losing money at the event - then cover their costs, that would raise entry fees a bit!! The NRA has 2 options presented to them Cardinal, and CMP eTargets at Perry, both don't require any investment from the NRA. Yes they will have to pay lease fees from Cardinal or CMP/Camp Perry for the event but they don't have to commit $ for assets. Even though they are a non-profit I believe they have internal rules to asset expenditure. There are lots of reasons the sport has dwindling participation. Crappy conditions at Perry are only one. But that said The conditions pictured are beyond miserable. They are unacceptable. You wouldn't hold a club match in a swamp why the national championships. Sure the CMP holds one side of the Nationals but is only a part. The EIC National Trophy matches are their responsibility, the NRA holds the NRA Nationals. You get a 2700 with the NRA. Only 100 shots with CMP. I wouldn't travel to shoot that. Certainly not to a swamp. dronning wrote: Many people had the same "historic" argument when the moved the Grand American from Vandalia, Ohio (1923-2005) to Sparta, IL. When it comes down to it either option is lost history. We either lose the location and change to eTargets, or we stay on paper turning targets and move to a new location. When the AMA moved to Sparta the sport didn't change just the venue. That's why Cardinal gets my vote. Now this one is in MY wheelhouse. I shot a decade at Vandalia,Ohio, amid the echo's of history, The charm of the walking the tree lined vendors row watching Giacamo work on my Perazzi with the movements of a surgeon. The locker room where you rubbed elbows with Leo H, and Ray S, Dan B., and George S.
But, you also parked in mud, if you could find a spot. took a trolley to your firing point, fired next to Airport signal lights and at taxiing airplanes. When the ATA was forced to lose their lease from the Dayton Airport for future expansion and decided to move to Sparta, Illinois a great outcry was heard. Well, I have shot at the new Sparta facility, it is the premier shotgun shooting facility in the country, and probably the world. It is a firing line that travels over 3 miles long. each firing point is accessible by car in an adjacent parking lot. What has been lost was the charm, and the closeness. But, if your a competitor, you want to shoot in the most perfect available shooting facilities. I've only shot Perry once, It was all I had heard about, but, I can easily see it is a dedicated rifle range. If Cardinal is making a dedicated range for smallbore/pistol, I would have no problems shooting Cardinal. You have to decide which you want, a first class competitive facility, or to continue the charm of Perry. 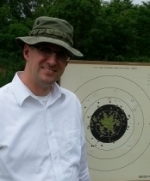 Danehogle: First, the reason for the decline in Bullseye/Precision Shooting is NOT due to Camp Perry serving as the venue for the national pistol championships or a target system that is long overdue for an upgrade. The real culprit is the rise of the shoot & scoot pistol disciplines: i.e., Silhouette, Cowboy action, 3 Gun, Bianchi Cup and run & shoot revolver. Society and a majority of shooters want the instant gratification that firing at a steel target that falls when hit or rings or firing at a cardboard silhouette target at close range based on speed is much more different than the dedication and commitment required by Precision Pistol Shooting. All one needs to verify this premise is look at the participation levels in the shoot & scoot disciplines compared to Precision Pistol. Obviously, new shooters/competitors gravitate to shoot & scoot. It took over a hundred years and two misnomers; i.e., Bullseye & Conventional Pistol to finally hit on the truly descriptive name of our sport--Precision Pistol. Additionally, if one assumes that electronic targets will be used, and, apparently, according to Dennis' tone and tenor, that's what will happen, how will Precision Pistol competitors deal with electronic targets then, at regionals, state championships and local sanctioned club matches, how will they adjust to paper turning targets? Will there be two classification systems--one for electronic and one for paper turning targets? The majority of clubs sponsoring regionals, state championships and sanctioned monthly matches cannot afford to convert to electronic targets. As an NRA & CMP affiliated club we looked at electronic targets three years ago. The cost was $2,000. per firing point, which was cost prohibitive for us and why would we "trash" a perfectly good and working electronically-timed, pneumatic target turning system just to follow the herd mentality? I'm o.k. with electronic targets for international and college & universities. An example to emphasize this point is that the WVU Smallbore and Air Rifle Team and all other college, university and military teams that compete in NCAA competition are using electronic targets. Even foreign shooting teams use electronic targets, so, there is not a learning curve when they are recruited for U.S. College & University shooting teams. In another vein, although the new huts are great, but there was something special and nostalgic about staying in the old Hootches; enduring them was all part of the Perry experience. Can we agree that Camp Perry provides a unique experience that separates it from Regional & state championships? Finally, how is spending $6.5 million saving money as you allege. Surely, it would not cost $6.5 million to upgrade the present target system at Perry. However, in my opinion, the decision has been made, all that's left for NRA is to get the competitors on-board the bandwagon. Someone will need to convince me that the Cardinal facility was not conceived and planned to hold the national pistol championships with out a wink and a nod from someone in the NRA Competition's Section. The conditions at Perry, rain, mud, wind are all part of the experience. It's like playing in a golf tournament and a monsoon settles in--you have two choices: continue competing or take a "DNF." Perry is no different in adverse or challenging conditions, everyone is competing under the same conditions! For those want no rain, no wind, no mud, concrete floors at the firing line, golf carts, "locked" showers, a facility-wide PA system or more creature comforts, shoot only indoor pistol matches. 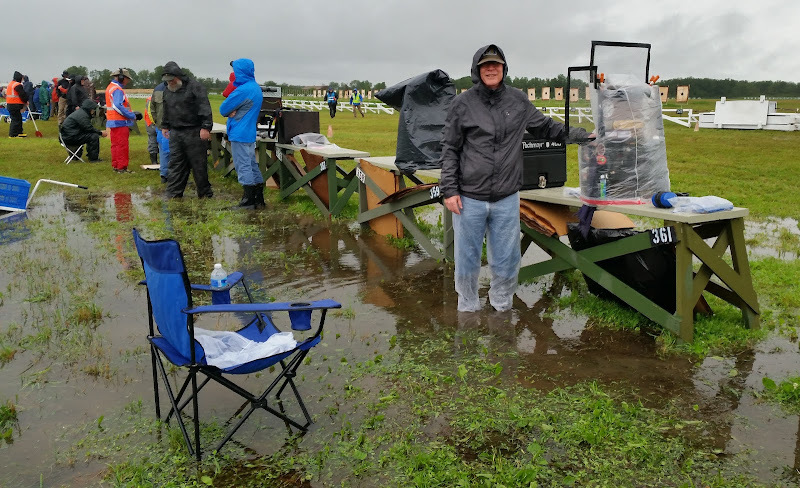 Just out of curiosity, can someone show me pictures or video of any other pistol discipline shooting their national championship in similar swampy conditions that Precision Pistol shooters do??? Brassmaster: The decline in shooters may not be due to Camp Perry but explain to me how shooting in those conditions helps?? My, my how the tenor of a simple question has changed dramatically. Perhaps I need to start over. At Camp Perry in 2015, I had a meeting with the CMP and OHNG. Everyone there believed that electronic targets are the future and Camp Perry should be completely outfitted to host Pistol, Smallbore, and High Power Championships. The question was, how will they be paid for. In the end, CMP advised they would ask their Board of Directors for permission to spend the money. I do not know if that has been done yet or if it will be approved. However, I believe that they will be successful and electronic targets will be coming to Camp Perry. In April 2015, I was asked to come to a "new" facility called Cardinal Shooting Center. I had no idea that the facility existed but apparently had been operational for some time. Someone at the facility wanted to have a combination range for Pistol and Smallbore and wanted me to look at their plans. I was impressed and was sure that this would be purpose built to attract the National Championships, except for High Power. However, the NRA had no part in this. We were content at Camp Perry. I had no further contact with anyone at Cardinal Center until earlier this month when Jake Spengler called me and asked about bringing the National Championships to Cardinal. I told him that I could not commit to leaving Camp Perry unless there was a range available. Making plans to leave, then finding construction was interrupted and the range was never built is not a good thing. I have long been a proponent of electronic targets. If I wanted you shooting on them I never would have brought up what's happening. I could have just kept quiet and let it happen. I also have no plans for Cardinal Center at this time, there isn't a range there yet. So the posters who think I plan on staying at Camp Perry or plan on going to Cardinal are both wrong. Knowing that by more than 2-1 pistol competitors have rejected electronic targets I thought that I would bring up the two options. Those are, if we stay at Camp Perry you will have electronic targets but all else remains the same. If you don't want electronic targets, then we HAVE THE OPTION of moving to Cardinal where they will have turning targets, but everything else that you are used to will change. I didn't create the options and I'm not dictating them or anything else to you. I'm simply looking into the future and letting you know what is happening. I'm further asking for your opinions about these two options. I do not see a third option at the present but if one crops up, I'll let you know. I am not advocating for either. I did spend a little extra time talking about Cardinal and that's because most of you have never been there. You know a lot about Camp Perry but little about Cardinal. Just because I told you about it does not mean I'm advocating for it. It's an option and nothing more. About ownership of the turning targets at Camp Perry, Neil Kravitz asked me about this a couple of months ago. I told him that I wasn't really sure but I knew that I was spending money keeping it operational. I did further checking and found out that CMP owns the system. NRA is responsible for maintenance when we are using it, but that's all. CMP owns all of the pistol benches as well. It is not likely that CMP will refurbish the old system all the while putting in electronic targets for $6.5 million. They will want to help pay for the new system by leasing it to us and removing the old system as an option will help cement this. The current electronic targets (those being made today) are truly state of the art. The pistol targets are armor plated to protect critical parts from damage. They are accurate to 1/100th of an inch and can handle 25 shots per second per target. Should a part become damaged, they are plug and play. Loosen a thumb screw, remove the damaged part, put a new one in and tighten the thumb screw. The sound chamber does not keep deteriorating as speculated herein. A rubber sheet moves downward following each strike of a round, resealing the chamber, thus keeping the sound chamber intact. In Norway they use electronic targets to score machine gun hits, so it's very capable. You will not have to move the monitors. In my discussions with CMP we agreed that two ranges were optimal. Half the targets, 100-150, will be set up at 50 yards. The other half at 25. Rather than moving forward to the 25 yard line following slow fire, you will move horizontally to the 25 yard line and complete firing from there. Meanwhile, a second relay will move onto the 50 yard range. The monitors are 100% waterproof. KTS shows, in their advertising, a fully functional monitor immersed in a fish tank. When a shot is fired and the system scores it, the results of that shot are placed in memory in the target circuitry, in the monitor circuitry, and in the stat office. With memory in 3 places, it's not likely that any data would be lost. Now, let's talk money. The NRA cannot complete with CMP in the cash arena. If they want, CMP could literally buy the competitions out from under the NRA by offering huge cash prizes at their events, which they could hold simultaneously as the NRA's events. Their budget per year is almost 4 times what my budget is and they only have the National Trophy Matches, Distinguished programs, Air Gun and a little Smallbore. At Camp Perry I often hear how much better CMP events are run than are the NRA events. It's even mentioned in this thread. However, CMP events are run by the very same staff that runs the NRA events. The same Match Director, tower talkers, referees, line officers, Chief Range Officers, etc. No difference. So, are they really run much better or mentally do you want them to be? Please don't look at these questions with a jaundice eye. I am coming to you so that, together, can make reasonable plans for the future. I'm not dictating or planning to move in any one direction. I've looked at what's happening and determined that major changes will happen whether we like them or not. I'm sharing this with you for your ideas. Many competitors welcome electronic targets but not the majority. However, no moves will be made to start the process to leave Camp Perry without a thorough understanding of what it all entails. Once gone, we likely cannot come back. The National Guard will lose that portion of the money they get to support the National Matches. According to them, once they lose it, they won't get it back. In addition, a political firestorm will occur, both within the state and federally, once such a move is broached. I do not wish to enter into that fray unless I'm sure that I'm doing the right thing for the right reasons. I can only tell you the truth. I ( and when I say I I mean Me, Dane Hogle.) am the one that approached Cardinal. It is I who came up with an initial design. It was me who invited Brian Zins and others to cardinal to show Their Manager, Jake Spangler, that this is a viable proposal and ask for there support and endorsement . With Brian's and others help, the NRA, Dennis Willings was asked to come to cardinal. I can assure you that Dennis did not know anything about Cardinal tell the he was asked to come for a site visit. I do not work for Cardinal. I do not work for the NRA. I have done this pro bono, yes free of charge, to better the sport, while we have a sport left. All I can ask you is to go to cardinal and take a look. Hell, call me and I will meet you there and show you everything. Dennis has said that the CMP would spend 6.5 million$ for e-targets. And that the NRA will be asked to pay a fee to use these targets, if they are installed. I can tell you that is more money than the proposed construction cost of the entire range complex at cardinal including the new Turning turning system. Thanks for the clarification, Denny.